Consultations are made by appointment. Please call (02) 9948 3768 to arrange an appointment. Please help us to run on time by informing our staff if you require a long appointment. Long appointments are sometimes needed for more complex problems, multiple problems, insurance medicals, age related health checks or pap smears. Please also make appointments for each family member who requires a consultation. While we aim to run on time, there may sometimes be longer waits if an urgent case needs to be fitted in or there was a patient with a complex problem before you. We apologise for any inconvenience this may cause you. Please let our receptionist knows when you arrive and show your pension or health care card if needing a discounted fee. Child, 45 year old and over 75 year old Health Assessments. Workers Compensation, Third Party Injuries and travel insurance reports are not refundable under Medicare. By arrangement with St Kierans parish, parking is available after 3.30 pm in church/school grounds. 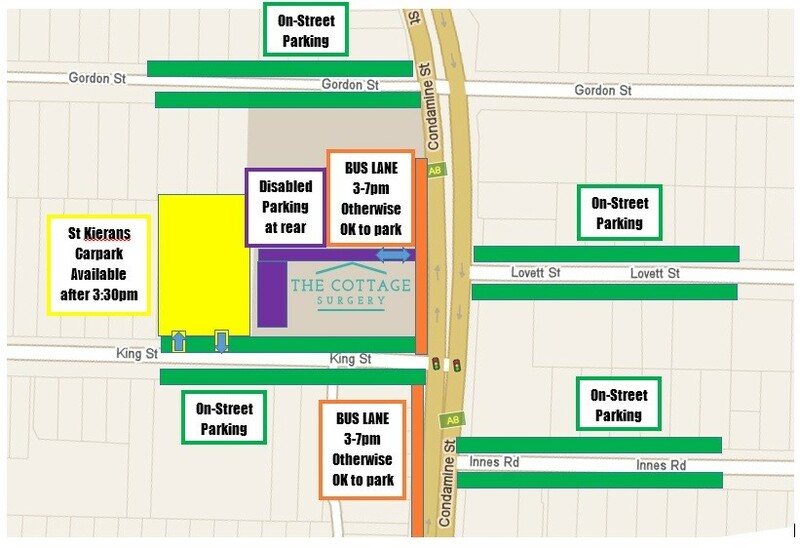 There is parking on Condamine Street at the front of the surgery till 3pm. There is also parking on King Street , Lovett Street and Gordon Street. Limited parking is available at the rear of the surgery for disabled (please call to see if available prior to arriving). There is disabled and pram access from the rear of the surgery and limited disabled parking. We have a disabled toilet available. We ask that you make an appointment with your doctor to have referrals, repeat prescriptions and medical certificates. We are legally not allowed to issue backdated referrals, so please ensure you have an up to date referral before seeing your specialist.